If you’re struggling to find the ideal venue for the most romantic night of the year, a certain popular high street baker may just have the solution. Greggs is offering the chance to sit down for an unusual Valentine’s Day meal, waiter service and all, in five of its stores around Britain. 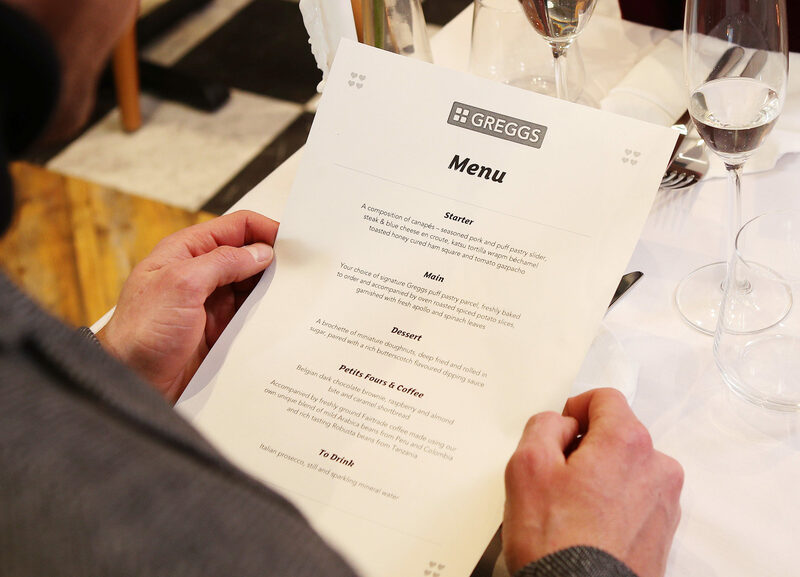 The menu will seem familiar but different to Greggs fans – featuring as it does seasoned pork and puff pastry sliders, a brochette of miniature doughnuts and, for the main course, “your choice of signature Greggs puff pastry parcel”. What may be more alien, given the surroundings, is the classical music being played in the background, the accompanying prosecco and the crisp white tablecloths. You’ll even get petits fours and coffee. A Greggs spokesman said: “For the first time in our history, we wanted to offer the public the opportunity to enjoy their Valentine’s Day evening in the comfort of their local Greggs. The five stores taking part on the big day are in London, Manchester, Glasgow, Newcastle and Cardiff – and, at £15 for two people, the event is likely to be considerably cheaper than most other Valentine’s deals on the high street. If you think your Valentine would enjoy a pastry-based February 14 to remember, you can book via Open Table. Reservations open on February 7. Starter: A composition of canapes – seasoned pork and puff pastry slider, steak and blue cheese en croute, katsu tortilla wrap, Mexican chicken chipotle spoon, bechamel toasted honey cured ham square and tomato gazpacho. Main: Your choice of signature Greggs puff pastry parcel, freshly baked to order, accompanied by oven roasted spiced potato slices and a garnish of fresh Apollo and spinach leaves and sunblush tomatoes. Dessert: A brochette of miniature doughnuts paired with a rich butterscotch flavoured dipping sauce. Petits Fours and Coffee: Belgian dark chocolate brownie, raspberry and almond bite and caramel shortbread. Accompanied by freshly ground Fairtrade coffee made using our own unique blend of mild Arabica beans from Peru and Colombia and rich tasting Robusta beans from Tanzania. To drink: Italian prosecco, soft drinks, still or sparkling mineral water. ​​​​​​​Running away to join the circus used to be a child’s ultimate dream.